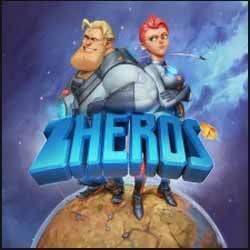 Zheros is a side scrolling bash-em-up shooter from Rimlight Studios which was originally released last year, but has been rereleased with a new DLC. From the initial screen, you have a couple of settings that can be looked at. 'How to Play' covers the various buttons required to attack, roll, fire your weapon, run and revive, useful if you get the game as a download. The controls section just displays a picture of your controller with all the buttons marked out. Lastly you get to the actual meagre settings where you can change the volume of the music and the SFX volume, you can also change the screen size. The start screen gives you options to play the game in either 'Easy', 'Normal' or 'Hard' mode, following which you get to choose from three characters, Mike, Dorian and Thione, there is a forth, but this is locked at this stage. The characters are cartoony with no option to personalise them, you get what you see and that’s it. There is no attempt to put the game into a context and no real story is involved. Following a quick cut scene, which boils down to an unknown character instigating an invasion, you're thrust into the first level, 'The Docks'. As your character you must traverse various science fiction themed environments. The screen displays your characters health and gun ammo, killing minions adds to your final RP. RP can be exchanged for power-ups and special moves it also displays your current score. There are red crates to smash and plenty of barrels to replenish your health. Few of the other environmental element you meet can be destroyed, nor does the game provide a map of the area, so when you go through one way doors you better be sure that you have covered all available routes and picked up any goodies laying around. 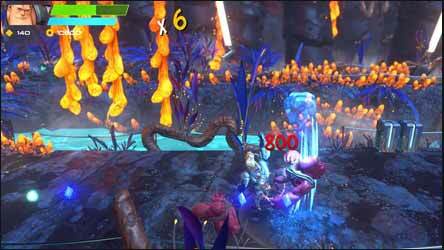 You will be met along the way with a variety of enemies to kick and shoot and the game only lets you progress once all of them are dead, there is no rush though as the levels don’t appear to be timed until the final score. There are various elements for your character to interact with which gives bonus points, which is why exploration is as important as combat. Finish a level and the game awards you a score for things like longest combo, bullets deflected. At the end of a level you can upgrade your fighting strength, your shield or your weapon depending on how many RP point you have scored. Whichever character you start with will remain with you through the game's eighteen levels. In actual combat both appear as strong as the other, Mike is more of a tank character while Dorian is a more of an elegant ninja. The fodder thrown at you can be varied, but you will see a lot of small robots to destroy - a little samey after a while but they are easy to beat and allow you to notch up points while exploring the levels. 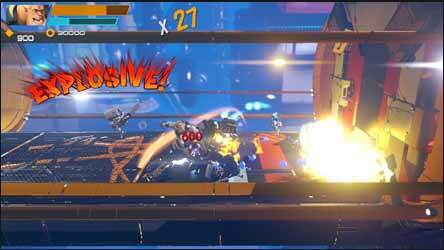 The levels themselves become increasingly more interesting and more hazardous as you progress through the game and while the rewards get greater so does the risk of being killed by electrified floors, lasers, jets of fire and conveyor belts. 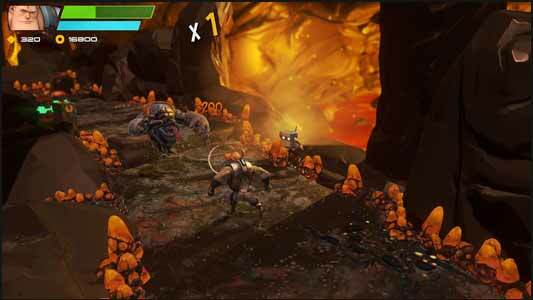 The combat has much to recommend it with lots of combos to try out and the characters are well animated. However, the controls can feel a little unresponsive during combat as the character must finish its animated move before it will allow the next. Also, while you can increase various stats the reality is that you can finish most levels by just hitting and kicking the opposition. 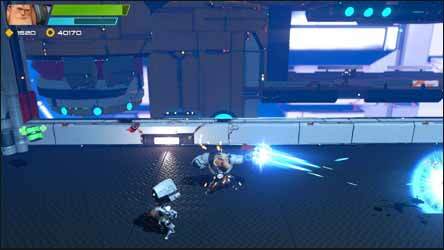 For all its brightly coloured levels, the game can become a bit repetitious, some of the wave after wave of small robots can eventually feel like a chore and I have no idea what is happening with the load times which feel way too long for a game of this type.